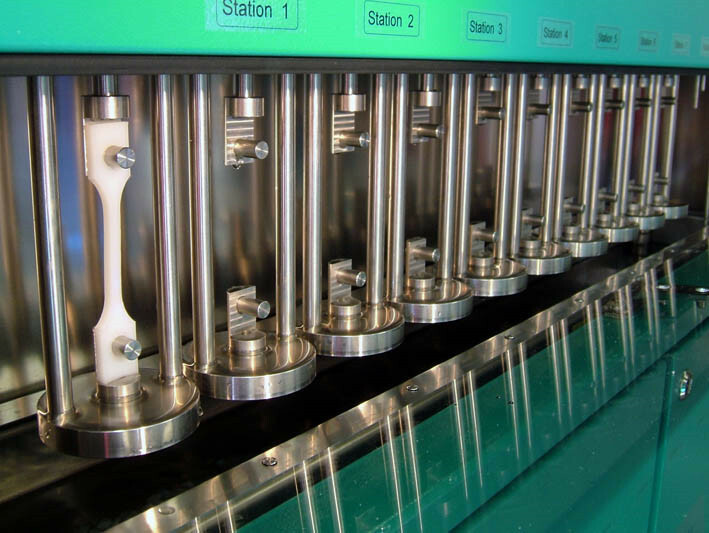 Full Notch Creep Tester (FNCT) - QT-FNCT-6 Series - For Testing of Plastics Materials is used to determine the stress cracking resistance of polyethylene materials in any environment. A test specimen in the form of a square-section bar with coplanar notches in each face at the center is subjected to a static tensile load in a temperature-controlled environment (ie. air, water, surfactant solution). The geometry of the specimen is such that plane strain conditions are obtained and brittle failure occurs under appropriate tensile load and temperature conditions. The time for this brittle failure to occur after loading is recorded. The Full Notch Creep Tester - EB-15-II-10 For Testing of Plastics Materials is available in different configurations the creep tester utilizes load cells and servo motors to apply and hold the load rather than the conventional method of applying dead weights. Apart from eliminating the handling problems associated with weights this design offers the possibility of running features such as temperature and load ramps controlled by the computer. 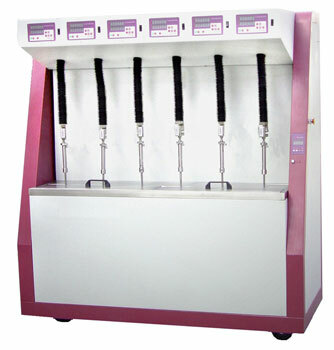 The Full Notch Creep Tester - EB-15-II-10 For Testing of Plastics Materials is offered in multiple configurations of test stations and load ranges (the Borealis unit has 10 test stations) and is available for testing in liquids according to ISO 16770 (Full Notch Creep Test) or in air according to ISO 899. For ISO 899 the test stations are built into a precision ageing oven for tight control of conditions for long term testing. Creep can be measured by clip-on extensometers on dumbbells or by the motor encoder when testing strip specimens. 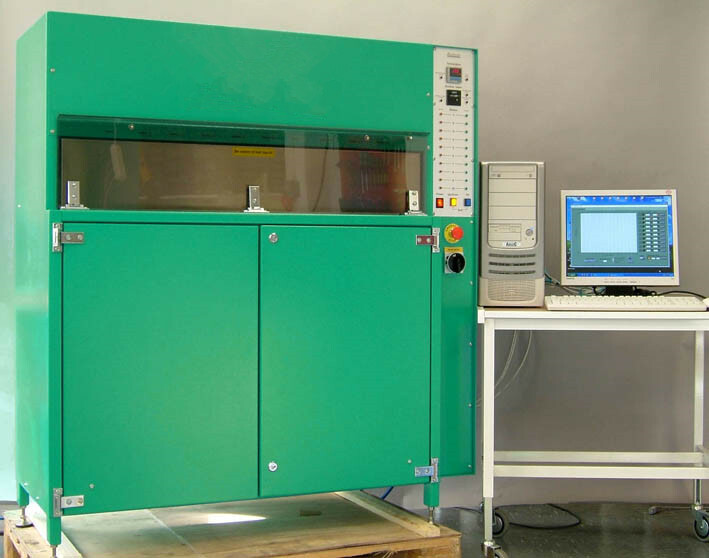 Utilising load cells and servo motors to apply and hold the load, the Creep tester both eliminates the handling problems associated with dead weights, and offers the possibility of running new features such as load and temperature ramps controlled by the computer.Results are presented in graphical and table formats as absolute creep or creep index. In order to study the actual sample failure the data logging rate is increased just before a break occurs. Precise control and distribution of temperature within the fluid bath is achieved by: Circulating the liquid from the top of one end of the bath to the lower part of the other end. The heating element is extended over most of the base of the bath to create convection within the bath for uniform temperature control and distribution. The same pump is also used for filling the bath from a storage tank, thus eliminating manual liquid handling. Temperature controller (PID) with 0.1 °C indication and set point. The temperature is set from the computer software. Peltier element cooling enables measurements to be carried out down to 20 °C. Liquid level control and alarm indicator. Embedded computer with PLC touch screen, color. Specification includes Windows based Creep Software. Support agreement first year is included. Installation is included in the purchase. The load is applied by a load cell – amplifier system with a PID control function. The elongation can be measured by the digital encoder in the motor. The load cell amplifier and the motor control are connected in a closed loop control which works even without the computer. The load is set from the computer software.